A sticky footer is a great way to encourage people to subscribe to your website’s newsletter, get more eyes on your advertisements or post short and important updates for your visitors. The difference between a sticky header and a sticky footer is that the footer doesn’t take up “prime real estate” on your blog’s page in the same way that a header does. Visitor’s eyes will naturally make their way down to the footer as they read through your content and it’s not disruptive to their viewing. What is a sticky footer? Typically, it’s a bar that runs along the bottom of your webpage, even when scrolling. View the live demo here . Let’s start out by creating a HTML webpage. Your webpage content goes here. 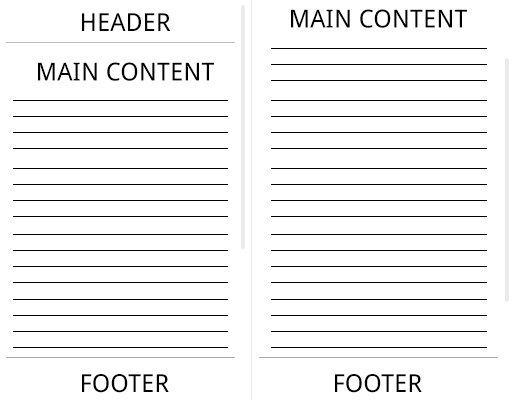 To be able to test the functions of your fixed footer correctly, you need to have enough content so that when viewing you are required to scroll down the page to continue reading. Next, we’ll add the footer div layer to the page. Now that we’ve got the basic set up for your webpage, we will rely on CSS to do the rest of the work. Use the following code in your style.css file or include it in between the script tags I have used above. I am going to include a little styling for mine, which is optional for you. Not only do you now have a sticky footer on your screen, but it’s also mobile responsive. Keep in mind that you will have to add some additional styling for mobile view if you want the viewer to be able to see what is in the footer. Widths should be set to 100% and heights to auto to ensure it shrinks to size correctly.